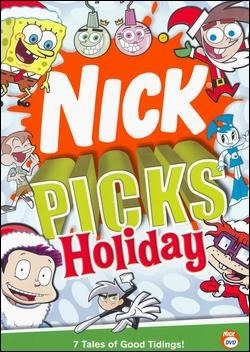 This was one of several holiday episodes and specials we got when we picked up a DVD titled "Nick Picks Holiday." I've heard of most of the series represented on the disc, but this is an exception. Apparently, this is a sequel to Rugrats, picking up ten years after the original series left off. Wikipedia informs me it lasted fifty-five episodes over five seasons, which is pretty impressive for an animated spin-off. I can't help but wonder if this would have made more sense if I'd ever actually seen an episode of Rugrats. I guess I'll find out soon enough - there's a special later on the disc. The first word I'd use for this is bizarre. And that applies to every level of the episode. The animation is extremely weird, likely a side-effect of being based on a show about toddlers and committed to making the characters identifiable ten years later. The writing might be even stranger. Note I didn't say "bad": just... strange. The comedy and dialogue actually display an impressive amount of nuance, especially early on. Until the plot kicked in, I was really enjoying this. Chuckie Finster hates that his father doesn't fully embrace the trappings of the holiday. He wants a big Christmas, but his dad always opts for the smaller tree and less gaudy decorations. There was actually a brief period where I thought the plot might be set up to teach his father a lesson about embracing the commercial side of the holidays. Had this been true, there'd be a "highly recommended" tag at the end of this, and *spoiler alert* there isn't. Instead, Finster is so focused on getting the Christmas of his dreams, he winds up accidentally stealing a giant tree after mistaking its proximity to the trash as a sign it's being disposed of. Once he learns about his mistake, the episode devolves into an awkward, melodramatic mess. That said, it does have some decent writing and solid jokes. Plus, its treatment of religion felt surprisingly mature (at least compared to most animated programs, which are terrified to touch the subject). It wasn't awful, but I don't see any reason to recommend it, either. It's certainly possible I'd feel more charitable if I'd seen more episodes and knew the characters better, but I don't really have much interest in doing so anytime soon.